Oil on panel, 18 1/8 × 14 1/8 in. from National Gallery of Art, Washington, D.C.
And Joseph also went up from Galilee, out of the city of Nazareth, into Judaea, unto the city of David, which is called Beth-lehem; (because he was of the house and lineage of David:) 5 To be taxed with Mary his espoused wife, being great with child. 6 And so it was, that, while they were there, the days were accomplished that she should be delivered. 7 And she brought forth her firstborn son, and wrapped him in swaddling clothes, and laid him in a manger; because there was no room for them in the inn. 8 And there were in the same country shepherds abiding in the field, keeping watch over their flock by night. 9 And, lo, the angel of the Lord came upon them, and the glory of the Lord shone round about them: and they were sore afraid. 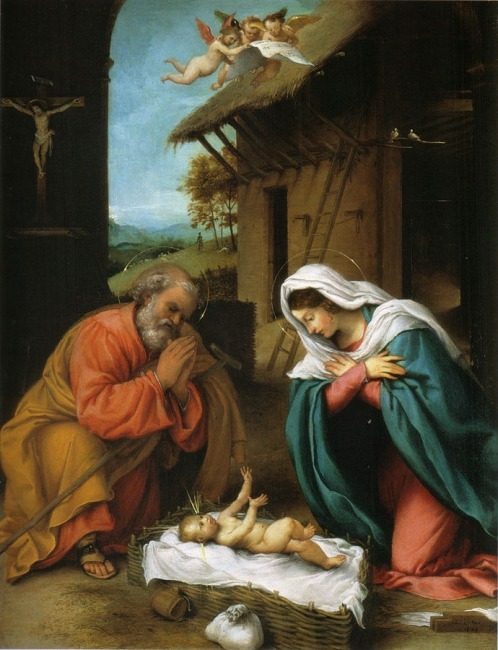 Read more about What Was the Star of Bethlehem? “And the angel said unto them, Fear not: for, behold, I bring you good tidings of great joy, which shall be to all people. For unto you is born this day in the city of David a Saviour, which is Christ the Lord. And this shall be a sign unto you; Ye shall find the babe wrapped in swaddling clothes, lying in a manger.”—Luke 2:10-12. WE HAVE NO superstitious regard for times and seasons. Certainly we do not believe in the present ecclesiastical arrangement called Christmas: first, because we do not believe in the mass at all, but abhor it, whether it be said or sung in Latin or in English; and, secondly, because we find no Scriptural warrant whatever for observing any day as the birthday of the Saviour; and, consequently, its observance is a superstition, because not of divine authority. Superstition has fixed most positively the day of our Saviour’s birth, although there is no possibility of discovering when it occurred. Fabricius gives a catalogue of 136 different learned opinions upon the matter; and various divines invent weighty arguments for advocating a date in every month in the year. It was not till the middle of the third century that any part of the church celebrated the nativity of our Lord; and it was not till very long after the Western church had set the example, that the Eastern adopted it. Because the day is not known, therefore superstition has fixed it; while, since the day of the death of our Saviour might be determined with much certainty, therefore superstition shifts the date of its observance every year. Where is the method in the madness of the superstitious? Probably the fact is that the holy days were arranged to fit in with heathen festivals. We venture to assert, that if there be any day in the year, of which we may be pretty sure that it was not the day on which the Saviour was born, it is the twenty-fifth of December. Nevertheless since, the current of men’s thoughts is led this way just now, and I see no evil in the current itself, I shall launch the bark of our discourse upon that stream, and make use of the fact, which I shall neither justify nor condemn, by endeavoring to lead your thoughts in the same direction. Since it is lawful, and even laudable, to meditate upon the incarnation of the Lord upon any day in the year, it cannot be in the power of other men’s superstitions to render such a meditation improper for to-day. Regarding not the day, let us, nevertheless, give God thanks for the gift of his dear son. I’m all for putting Christ back in Christmas. And there is no doubt that our secularized culture is working hard at surreptitiously ushering the Baby out, without losing the murky bathwater of gift-giving and commercial celebration. But I’d like to address the misinformed concern that the use of “Xmas” as a placeholder for “Christmas” is part of the conspiracy to excise Christ from his holiday. First, Christmas is not a biblical holiday. There are no New Covenant feast days; besides communion, there is no recurring remembrance that is mandated. The Catholics came up with the Christ Mass feast, and global retailers and consumers alike hopped on the bandwagon. So, if Jesus becomes as absent to the secular mindset from Christmastime as he is from Halloween, there is no loss to the New Covenant. Second, and this is my main point, using “X” to replace “Christ” is not necessarily an indication of anything sinister. I have used Xmas and Christmas interchangeably with a clear conscience ever since learning about the history of its usage. A little more than 2,000 years ago, “When the fullness of the time had come, God sent forth His Son, born of a woman, born under the law” (Gal. 4:4, NKJV). It was exactly the right time, as predicted by Daniel (cf. 9:25) and confirmed by Jesus (cf. Luke 19:41-44). The time was right, the place was right, and the circumstances were right. It was not to the high and mighty in Israel that the first coming—the incarnation—of Messiah/Christ was celebrated by “a multitude of the heavenly host” (Luke 2:13) in heaven and on earth. It was to a group of lowly “shepherds living out in the fields, keeping watch over their flock by night” (Luke 2:8).